Political rivals China and self-ruled Taiwan have entered a third year of stalemate, making the ever more frustrated Beijing likely to find new, uncomfortable ways of pressuring Taiwan to the bargaining table. The two sides have been separately governed since the Chinese civil war, when Chiang Kai-shek’s Nationalists fled the mainland and reestablished a government in Taipei. China insists on unification someday and has not ruled out use of force if needed to achieve it. Public opinion surveys show most Taiwanese oppose unification. On Sunday the Chinese government’s Taiwan Affairs Office said it would stick this year to its demand that the democratically island agree, for dialogue purposes, that both sides belong to a single China. Taiwan President Tsai Ing-wen rejects that idea. She had called for respect Friday during a year-end speech. Neither side has offered dialogue terms acceptable to the other since early 2016, making any talks unlikely and threatening to chill longer-term relations. 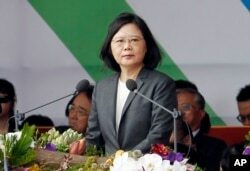 China stopped formal dialogue in mid-2016, shortly after Tsai took office, following eight years of warm relations under her predecessor. Taiwan is unlikely to change course this year, analysts say. That means it would avoid inflaming officials in Beijing while resisting any moves from China that imply Taiwan belongs under its flag, they say. Taiwan's President Tsai Ing-wen delivers a speech during the National Day celebrations in front of the Presidential Building in Taipei, Taiwan, Tuesday, Oct. 10, 2017. Taiwan’s ruling Democratic Progressive Party will avoid changing its China policy to head off any public backlash before city and county elections in late 2018, scholars believe. Voters upset by any change might pick opposition candidates, including “radical” people who advocate Taiwan’s legal independence from China, said Wu Chung-li, a political science research fellow at Taipei-based university Academia Sinica. Officials in Beijing would see Taiwan’s legal independence as secession. Losses in the local elections could hobble the ruling party's 2020 presidential election campaign. Tsai already faced a 38.6 percent approval rating in November, a drop from the previous month, according to a Taiwan Public Opinion Foundation survey. China will use “creative” means to pressure Taiwan to the bargaining table on its condition that both sides are one, said Gratiana Jung, senior political researcher with the Yuanta-Polaris Research Institute think tank in Taipei. They expect more of the moves seen in 2017: Chinese military planes circling the island, curbs on Taiwan’s overseas diplomacy and extradition of Taiwanese telecom fraud suspects from third counties to China for follow-up prosecution. 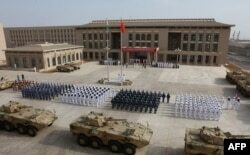 China operates the world’s third strongest military, compared to Taiwan’s at No. 18, according to the GlobalFirePower.com database. Liu Jieyi, Beijing’s point person for Taiwan relations, may use his international ties to limit Taiwan’s diplomacy, Jung said. China has more than 170 diplomatic allies, compared to Taiwan’s 20. Taiwanese also fret over spying orchestrated by Beijing. The Taipei prosecutor’s office said Tuesday three members of the minor opposition New Party's youth corps had violated national security laws by working with a mainland Chinese man convicted last year of trying to bribe Taiwanese officials on behalf of his government. China also shows signs of reaching out to common Taiwanese people as a way to gain favor for its goal of unification, analysts say. “They’ll definitely think of new ways to attract Taiwanese people,” Jung said. One key strategy: making it easier for Taiwanese to work in China. About 420,000 Taiwanese were employed there as of 2015, taking advantage of an economy that's more than 22 times the size of their homeland's. Some report higher pay and more job choices compared to Taiwan. In 2017, Chinese officials put in place 20 policies for Taiwanese people who live, work or travel in China, Beijing’s official Xinhua News Agency says.